RYOBIs 18V 4Ahr Upgrade Kit keeps DIYers and pros ready to work on projects with fully charged batteries at all times. It provides users a 4Ahr battery that has up to 4X runtime and a Dual Chemistry Charger that can charge all Ryobis 18V ONE+ batteries in as little as 30 minutes. The Bosch HDH183-B24 18 V EC Brushless Brute Tough 1/2 inch hammer drill/driver kit includes two CORE18V batteries the best-built battery on the planet (vs. leading power tool competitors). The HDH183's KickBack Control automatically shuts the tool down when a torque reaction occurs in a bind-up scenario. The hammer drill has a 25+1 precision clutch, an upgraded all-metal chuck, and an EC Brushless motor that delivers up to 663 inch-lbs. of torque. Each CORE18V battery uses next-gen Li-Ion technology to produce 80% more power than previous gen batteries. In independent testing, the tool powered by the CORE18V drilled up to 120 holes with a 1-1/4 inch spade bit through two 2 x 4s. The battery's CoolPack 2.0 technology provides up to 35% more cooling effect than batteries without CoolPack. The CORE18V is 100% compatible with all Bosch 18 V Li-Ion tools and chargers. The fast charger charges a spent CORE18V to 80% ready in only 41 minutes. The Ryobi 18V ONE+ System presents the AirStrike Combo Kit. This combo kit includes the 18-Gauge brad nailer, 16-Gauge finish nailer, one 1.3 Ah battery and charger. Both nailers feature Airstrike Technology that eliminates the need for noisy compressors, bulky hoses or expensive gas cartridges. This means faster setup and easier maneuvering on the job site. The Ryobi P320 AirStrike Brad Nailer drives 18-Gauge nails from 5/8-inch to 2-inch length. Also included is the 16-Gauge Straight Finish Nailer that also features Airstrike Technology, which eliminates the need for noisy compressors, bulky hoses or expensive gas cartridges. This means faster setup and easier maneuvering on the job site. 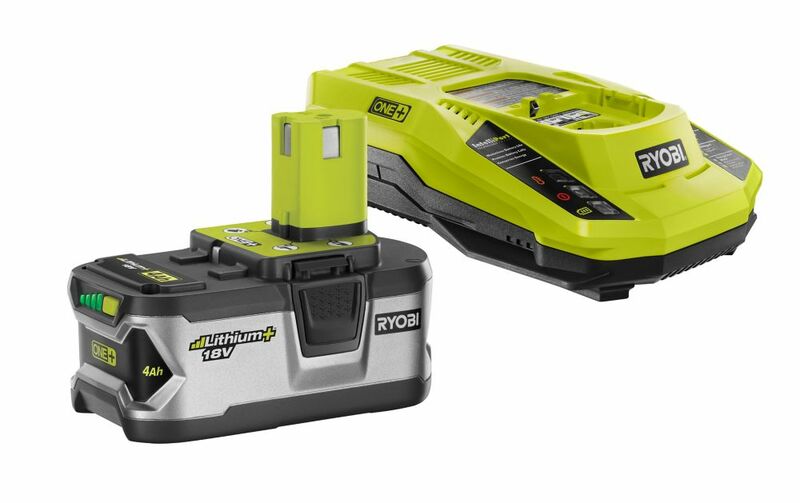 Best of all, like every Ryobi 18V ONE+ blue or green tool, these AirStrike Nailers work with any 18V ONE+ battery, like the P102 that is included in this kit. 18V 4Ahr Upgrade Kit RYOBIs 18V 4Ahr Upgrade Kit keeps DIYers and pros ready to work on projects with fully charged batteries at all times. It provides users a 4Ahr battery that has up to 4X runtime and a Dual Chemistry Charger that can charge all Ryobis 18V ONE+ batteries in as little as 30 minutes. 18V 4Ahr Upgrade Kit is rated 5.0 out of 5 by 1. Rated 5 out of 5 by David from More than I thought. I've had this now for a couple of months and it's made all my Ryobi tools perform like new again. Even better it has revived a couple of my older batteries that wouldn't take a charge anymore. Unfortunately it couldn't revive them all but it has done more than I had expected.